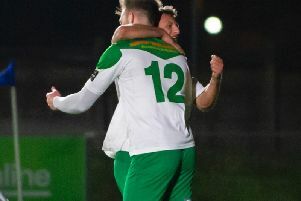 Lee Bradbury saluted the fighting spirit of the Hawks even though they failed in their bid to reach the Vanarama Conference South play-off final. Chasing a two-goal deficit from the first leg, the Hawks could only manage a 2-2 draw against Boreham Wood at Meadow Park which meant a 4-2 aggregate defeat. For just over an hour, though, Bradbury’s team had Boreham Wood on the run and threatened to turn the tie on its head. It was only a catastrophic defensive howler involving two of the Hawks’ most experienced campaigners that allowed the home side to regain the initiative. Bradbury is hugely disappointed to miss out on the final because he knows just how close his side could have come. He took consolation, however, in the way his players refused to give up without a fight. ‘I told the players in the dressing room straight after the game they can hold their heads up high,’ said Bradbury. ‘They gave it everything and at one stage we looked like we would go on and win it. ‘The intensity and work-rate the players showed was second to none and showed how much they wanted it. ‘Once we scored early you could see the confidence drain out of Boreham Wood. ‘There was fear in their eyes and we had the initiative. After an initial Boreham Wood flourish the Hawks, with experienced pair Ed Harris and Brian Stock back after suspension, took charge. They knew an early goal would change the whole complexion of the tie and that crucial strike arrived after 16 minutes. It was a fantastic, well-worked goal straight from the training ground. Ben Swallow played a corner to Stock lurking outside the right-hand side of the area and the ex-Burnley player delivered a pin-point cross to the far post. Brian Dutton, who was inspired all afternoon, rose above his defender and thundered a header into the net. It was the Hawks who finished the half stronger with their hosts looking decidedly worried and that didn’t change until the 63rd minute. When Scott Donnelly played a ball back to the edge of his own area there seemed little threat. Unfortunately goalkeeper Ryan Young and full-back Warren Cummings left it for each other, allowing Ricky Shakes to nip in and roll the ball into the empty net. Bradbury refused to criticise the players for their error. ‘The players involved have been magnificent for us all season so I am not going to slam them,’ said the manager. The Hawks were deflated and three minutes later the game was up when Lee Angol added another goal. Substitute JJ Hooper did level the scores on the day for the Hawks but that was merely a final act of defiance. Bradbury said the players dedicated their performance to absent chairman Derek Pope. Pope suffered a heart-attack during the first leg on Wednesday and was recovering at home. ‘We may have lost but I am sure Derek would have been proud of the players,’ said Bradbury.